So I set off, free-wheeling into a world of cascading coastal scenery without so much as a key to my name. Scotland’s Western Isles hang north to south in a 130-mile-long pendant of bays, highlands and lackadaisical bike thieves. A mere 26,500 people make their homes here, two thirds of them clustered in the north. In terms of long-distance cycle rides in the UK, it’s as enticing a route as you’ll find. Patrick, it transpired, knew his islands. 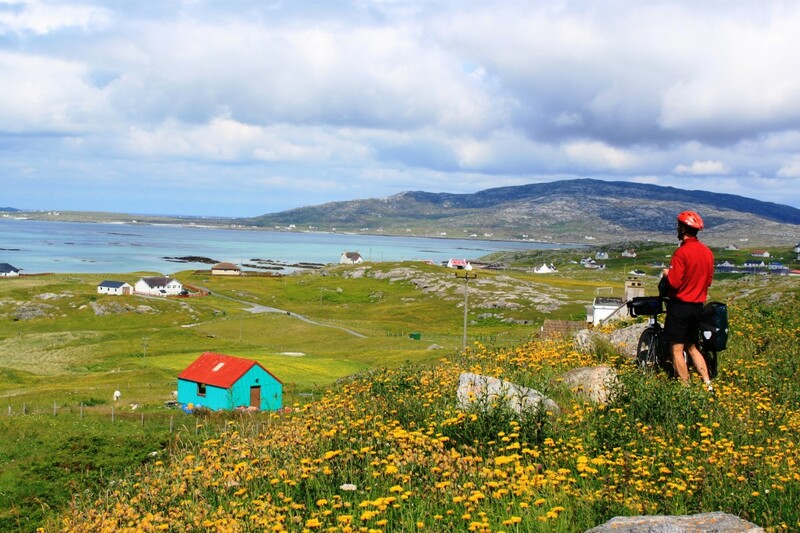 Earlier this year, he and his colleagues at tour operator Hebridean Hopscotch noted the archipelago’s growing appeal to two-wheeled travellers and introduced an all-in cyclists’ package with bike hire, ferry tickets and end-to-end accommodation. I’m what should be termed a casual cyclist (I wobble into town two or three times a week when at home, but wouldn’t know a derailleur if I ran over one) so the simplicity of the adventure was attractive. I’d arrived onto the northern island of Lewis, meaning I was setting off from Stornoway, the region’s administrative centre. In the local tongue – a form of Gaelic that shares much with the Irish language – the name becomes Steòrnabhaigh, lending the place a touch more exoticism than its pebbledashed cottages probably warrant. It seemed a proud, pubby little town, perched in the Atlantic at close to the same latitude as John O’Groats, but as a precursor to what the island chain was to hold, it gave barely a hint. Barra, my journey’s end, was nine islands, six causeways and two ferry crossings away. Seventeen miles was all it took. By the end of the first day’s cycling, the shortest leg of the week in terms of distance, I was smitten. Lewis is a fiercely beautiful island, softened by sea lochs and rounded by hills that layer and rise into the distance. Traffic had dissipated to a trickle within a few miles of leaving Stornoway, so soon it was just me, the afternoon and the winding road. I learnt that getting lost in the Outer Hebrides is nigh impossible and, by the evening, that fresh langoustines, cask ale and a view of Loch Erisort make for a worthy post-cycling combination. “Time has its own pace here,” said Bernie, the owner of Loch Erisort Inn the next morning, “which is how we like it.” I’d been told that the 40 miles of water separating Scotland’s Western Isles from the UK mainland were more than just a geographical divide, and so it appeared. Things operate differently out here. Daily papers arrive at no fixed o’clock. Nine out of ten passing drivers wave at cyclists. Even the sheep, in coats destined to become Harris tweed, chew through the day with a kind of ocean-sedated mellowness. So as the days went by and the sun, shockingly, made itself a familiar sight, the various islands came upon me quietly. It was bliss, really. Viking invaders settled here centuries ago, and they wouldn’t have needed to look far to find landmasses to divvy up. Within 48 hours of setting off I’d become acquainted with Lewis, Harris, Berneray and North Uist. Harris itself was astonishing, marking the highest point of the route (and the only truly lactic-legs uphill slog) with a tumbling panorama of moorland and mountains, then following it up with a genuinely breathtaking mile-wide beach scene, its colour scheme apparently pinched wholesale from some tropical atoll. More of the same was to follow. The cycle route itself can be done either north to south or vice versa – I passed a total of some thirty people pedalling the other way – but to my mind it felt right to be beginning in the relative bustle of Stornoway and flowing gradually down into the croftland, valleys and low-roofed villages of the south. They say the prevailing wind usually favours those heading north, in which case the breeze was kind to me. As well as being spectacularly attractive, the islands are also deeply religious. “Presbyterian in the north, Catholic in the south,” one local explained, adding with a wink: “You’ll see people’s propensity for fun increases the further down you go”. It meant that on Sunday the roads were ludicrously quiet (and the shops, it should be noted, very much closed for business). But no one told the wildlife. On Berneray, not long after the flick of a tail signified an otter that had noticed me first, I watched a group of five seals hefting themselves onto rocks, then later stopped to gawp at a pair of hen harriers in the skies above North Uist. The same island’s famed golden eagles, apparently greater respecters of the Sabbath, sadly remained hidden. The cycling itself was split into manageable chunks – 41 miles being the longest stage, a distance easily fuelled by the mound of eggs, potato scones and black pudding that constitutes a Hebridean breakfast – and the further south I reached, the clearer it was that each island had its own defined character. Benbecula was a flat, peaty palette of greens and yellows. Grimsay was folded into coves and humpy headlands. South Uist, a real heart-tugger, was a vision of beaches and wildflowers, where the hills seemed to lean out of the landscape to get a better view of the butterwort and orchids. I cycled in a rare contentment. The long decline of crofting and the predictable exodus to the mainland of university-age youngsters mean the Outer Hebrides are changing with the times, but the islands nonetheless remain very much their own place. “I’d say we’re less wary here, more trusting,” a South Uist barmaid told me, and as the single-track road continued to spool south, I found myself agreeing, lulled into a hard-to-define freedom that comes from being somewhere both welcoming and remote. There were times when paying in sterling or spying a Royal Mail van momentarily took me aback: this was still the UK? My legs were tired by day five. When Barra appeared, rumpled and olive on the horizon, I spent the ferry-ride to its shore feeling a mixture of elation and relief. It seemed fitting, though, to have saved arguably the prettiest island for last, and my final two hours of cycling took a circuit of the clichés and superlatives that were its coastal contours. That evening, in golden light, I sat outside a hilltop pub looking onto a castle in the bay below. Two local drinkers – straight out of central casting, as they say – unpacked accordions and played into the sunset. It was, like much of the week, almost laughably magical. And the bike? Propped outside each night, and quite probably still where I left it. © Ben Lerwill 2019. All Rights Reserved.